“Direct manipulation” is one of those Human-Computer Interaction (‘HCI’) terms that sounds intriguing. During the online HCI course instructed by Scott Klemmer which I did recently, I learned a bit more about what direct manipulation means. Direct manipulation is a HCI method which involves continuous representation of objects of interest and rapid, reversible, and incremental actions and feedback. I guess the essence of direct manipulation is to allow users to manipulate objects that are presented to them, using actions that resemble – to varying degrees – the physical world. In the lecture, Scott talked about “The Gulf of Execution” and “The Gulf of Evaluation” as introduced by Don Norman and Bill Verplank; how can a user interface bridge the gap between the user ‘knowing what to do’ (“The Gulf of Execution”) and the user ‘knowing what has happened’ (“The Gulf of Evaluation’)? In essence, direct manipulation is about making the interaction between a system and its users as easy and seamless as possible (see Fig. 1 below). Scott went on to talk about how easily users can do certain tasks, as outlined in Don Norman’s The Design of Everyday Things (see Fig. 2 below). Affordances and signifiers – Don Norman introduced the terms “signifiers” and “affordances” in his book, The Psychology of Everyday Things. A “signifier” is some sort of indicator, a signal in the physical or social world that can be interpreted meaningfully. In design, you can use signifiers to convey critical messages to the users. “Affordances” are all about the perceived and actual properties of a thing which determine how this thing can be used. 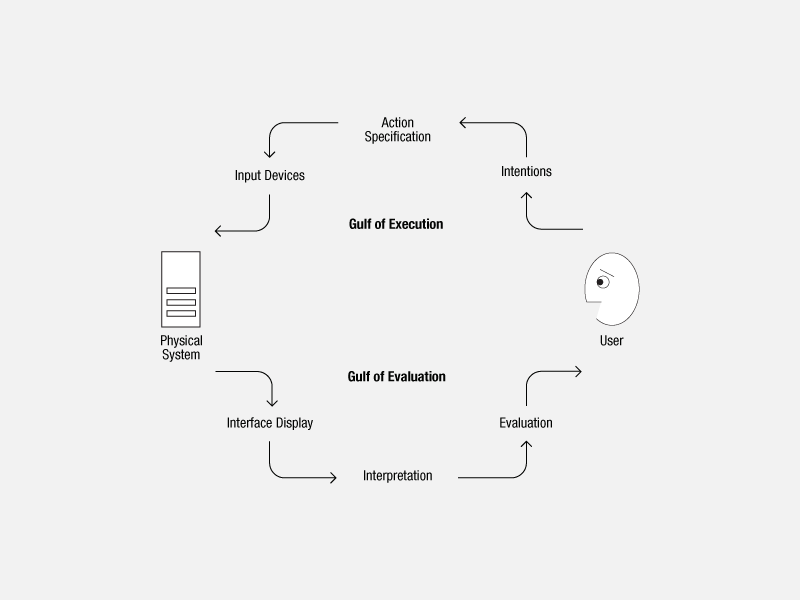 Reducing the gulfs – Apart from providing visibility through affordances and signifiers, Scott mentioned a number of alternative ways to reduce the ‘gulfs’ in users knowing what to do and knowing what has happened (see Fig. 3 below). Graphical User Interface (‘GUI’) vs command line – It was interesting to hear Scott compare the pros and cons of a graphical user interface (‘GUI’) against those of the command line interface. Initially, I was strongly inclined to think that a GUI would be much more intuitive and better from a direct manipulation point of view. However, Scott explained that the command line interface tends to work better when the direction it offers is a benefit rather than a drawback (see Fig. 4 below). Gestural interfaces – At the end of the lecture Scott talked about how all of this direct manipulation stuff applies to gestural interfaces. These interfaces can be a good remedy against menu creep because as a designer you’re almost forced to keep the gestural interface as simple and as minimal as possible. With natural gestures tends to come immediate and clear user feedback. Main learning point: I didn’t find direct manipulation the most straightforward of topics within the HCI course. However, after spending a bit more time understanding concrete examples and the ways in which the “Gulf of Execution” and the “Gulf of Evaluation” can be reduced, I felt a bit more confident about direct manipulation and specific things to look out for. Determine the function of the device? Tell what actions are possible? Determine mapping from intention to physical movement? Tell what the system is in? If the system is in its desired state? Determine mapping from system state to interpretation? What on earth is “mob programming”! ?